Society Shoppe merchandise is 100% donated by people like you. Generous, kind, compassionate people like you. Rest assured your donations, however big or small, are appreciated and going to the right place. We are a registered charity which means we have to follow lots of rules and report with absolute transparency on an annual basis. 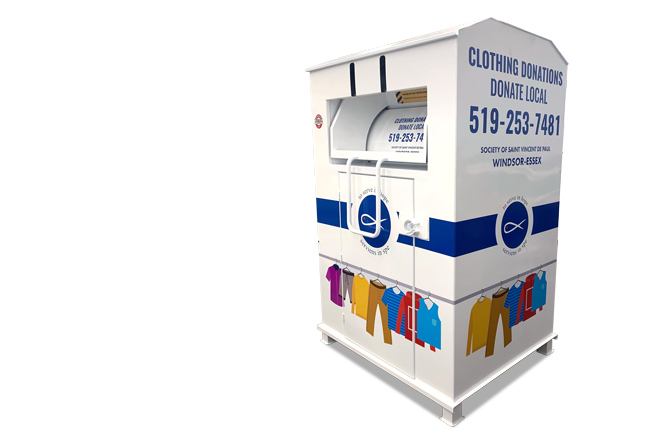 Look for the white and blue donation bin near you for donations of clothing. For your convenience, we offer donation boxes throughout Windsor and Essex County. Call 519-253-7481 to schedule a free pickup of your furniture/appliance donation. Or… We’d love to see you. Why not drop in and hand deliver your gently used donation in person? That way you can see how much we do appreciate your participation. We also accept donations of non-perishable food items and cash money at all our locations. • Please use the regular size garbage bags for your clothes as they are easier to put inside a donation bin and for the employees to lift. • Only put clothes in the donation bins. • Please do not leave furniture and boxes outside the bins as these items can get stolen or damaged. We are more than happy to pick them up. • Please do not leave items at our stores back doors during closed hours. • Please bring your donations during store hours. • Please consider dropping them off at a drop off location Chilver Rd and King Street in Windsor or Essex and Leamington in the county. • Our Harrow and Amherstburg stores have very limited space. Please consider the size of the donation and if you can please call for a pickup or take to Essex as a drop off site. • If the hours are not convenient please call or email and we will pick up your donation. Every year we have been dealing with increasing costs of waste disposal which reduces the amount of money we have for our programs within the Windsor Essex community. Weather can destroy your precious donations, so please take this into consideration when donating. If in doubt please call or email for a pick-up. Questions? – Please call 519-253-7481 for more information. Serving the people of Windsor and Essex County since 1896.